What are ESCOs (Energy Service Companies) and what do Energy Auditors do? Energy saving has been the talk of the world, and very aptly so. Due to the population explosion the pressure on the natural resources available to us is enormous since the supply is not sufficient to cater to the needs of the people for a very long period of time. So, steps should be taken to put a bridle on the exorbitant usage of the natural resources and finding green and sustainable alternatives to the same. An Energy Service Company (ESCO or ESCo) does just the same. An Energy Service Company or ESCO is a company which offers energy saving solutions to customers. This includes offering a variety of services like energy service outsourcing, conservation of energy, risk management and so on. These kinds of companies can be commercial and non-profit organisations as well. What it does is it analyses the property in consideration, chalks out a plan that is energy sufficient and implements the same by installing the required devices and appliances and makes sure that there is energy saving. The savings generated in such a way are then used to pay-back the investment made by the customer over a desired time-span. If in any case, the ESCO is not able to deliver on the investments made by the customer, it pays back the difference thus made. Although they can provide their services to a housing society wherein a large number of houses are involved, ESCOs typically don’t provide services to individual residential places, as it wouldn’t have any financial viability. However they may take up a project for a mansion or a villa where the electricity consumption is very high. ESCOs follow a simple procedure to calculate the potential energy savings. An ESCO first does a thorough inspection of the concerned property. It analyses the various appliances that are contributing to the total energy consumption. After the complete analysis they provide feedback to the customer about their findings i.e. about the appliances that are the most electricity consuming and offer a plan to reduce the electricity consumption. If the customer sees it fit, then the suggestions made by the ESCO are implemented. The ESCO also offers to finance the whole plan in return of which it stakes claim over the savings made by the customer for a definite span of time after implementation of the plan suggested. Although ESCOs had not been very popular in India, but due to continuous increase in the demand of electricity they are gaining grounds in India as well. So if someone wants to establish a commercial or an industrial space, or want to optimise the electricity consumption in an existing property, utilising the service of ESCOs would be a tremendous option to facilitate reduction of expenditure on electricity. When you try to know more about ESCOs, there is a term which keeps popping up and it is EPC (Energy Performance Contract). These are basically contracts which ensure that the improvements made in the property of the customer after implementing the suggested plan of the ESCO shall result in electricity saving. EPCs also dispatch the operational risks to the concerned ESCO. These risks include different factors. Let us understand a few of them in detail. 1. Energy saving: The whole point of bringing in ESCOs in the picture is saving energy. So this undeniably becomes the most important condition which should be fulfilled. After energy audits are carried out, the ESCO furnishes the detailed analysis of the consumption and installs the required appliances and devices. It is of utmost importance that after implementing the plan suggested by the ESCO, energy is being conserved. After all, it’s all about saving electricity in the first place. 2. Technical support: If the contract is chalked out as such in which the ESCO is to bear the expenses of the equipment as well, then it becomes another important feature of the EPC. Under this, the ESCO bears all the expenses which are made on putting in place the equipments (energy efficient) which it suggested it would help in reducing the electricity consumption. 3. Monitoring and maintenance: ESCOs also offer to be accountable for the maintenance of the equipment which it had installed at the property (if these services are covered in the contract between the ESCO and the customer). There are different financial models which facilitate the interested party to make the best decisions when in need of an ESCO. Usually there are three parties involved in these models: Financial agents (e.g. investors, creditors, utilities or banks), the client and the ESCO. 1. 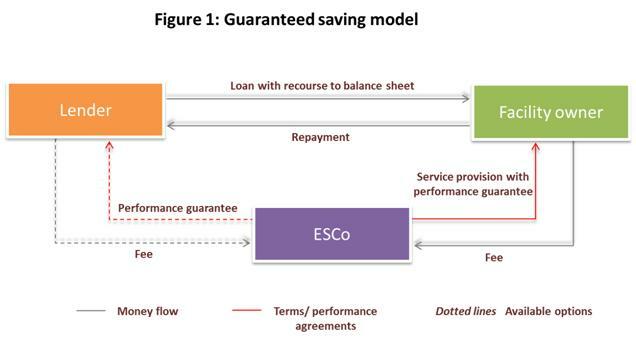 Guaranteed Savings Model: Under this model, the ESCO takes guarantee for a certain amount of energy saving that would be generated after improving the building. By doing this, the ESCO protects the client from any kind of operational risk and thus ensures a smooth and sustained service of the suggested plan. 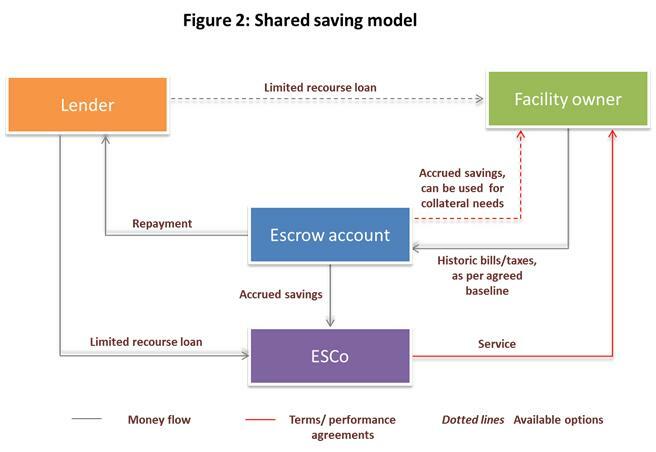 In this kind of a model, the client has to be financed directly by the financial agent (say a bank) as it is better equipped against any financial risks than the ESCO. The client thus has to pay back the loan to the bank in return of the financial aid that it had provided. a. If energy savings are lesser than what was guaranteed by the ESCO: The ESCO pays the remaining amount (difference between the total loan amount and the energy savings made) to the bank. b. If energy savings are more than what was guaranteed by the ESCO: The client has to pay the excess amount (the difference between the energy savings that were estimated and the savings actually made). 2. Shared Savings Model: Under this model, the client takes up the risk associated with the performance of the plan thus avoiding the credit risk. It means that ultimately the ESCO comes under both the credit risk as well as performance risk as it has to make sure that the suggested plan works properly as if it does not, the ESCO will be liable to repay the loan to the bank. To put it simply, if the revenues of the client stop, then it is the ESCO which suffers a major setback as it has to repay the loan. However, care should be taken while going for this model, as if the actual energy savings are more than what was estimated by the ESCO, the ESCO might understate the energy savings and take away more of the excess savings. ESCOs not only provide a detailed assessment of the energy consumption of the property of the customer and providing a plan for increasing the energy efficiency, but also bear the entire expenses incurred on installing the appliances/devices which they had suggested. In return of this, the concerned ESCO takes the savings made on the electricity expenses obtained after implementing the plan which the ESCO had suggested for a given period of time. Energy Auditors: Who are they? The dictionary meaning of the word “Audit” is ‘an official examination and verification of accounts and records’. So energy audits mean inspections and analyses that are made to determine the total energy consumption on a residential or a commercial scale in order to reduce the consumption of energy. It is often stated that the first step towards energy conservation and ultimately savings on the expenses on electricity is to get a detailed knowledge about your consumption. That is what energy auditors or energy raters do. They are specialised professionals in the field of providing information on the electricity consumption and measures that could be taken to curb the consumption. Bureau of Energy Efficiency (or BEE) provides certification to people competent to perform such audits and it is always advisable to take the services of an ESCO which has a good number of BEE-certified energy auditors. 2. Compute the electricity consumption of individual appliances and equipments. 3. Suggest measures to reduce electricity consumption wherever required. An energy auditor calculates the total energy consumption of the establishment concerned and offers suggestions to reduce the electricity consumption. The types of test he performs also depends on the knowledge of appliances he has and his personal proficiency. In addition to the heating and cooling system of the buildings, energy auditors also conduct inspections of the insulation system of buildings to optimise the consumption of electricity. Since electricity is a very important resource, energy auditors need to be certified to perform energy inspections. Energy evaluation is a very important step towards saving electricity. It is very important to have a comprehensive understanding of the amount of electricity that you are consuming. Because it facilitates better decisions that are taken in the direction of conservation of electricity which ultimately saves money. And energy auditing is just the first step that once can make in that direction. Hiring services of an ESCO (or energy service company) can be a great step to understand, monitor and control your electricity consumption with least financial risks.